EKO India Financial Services Pvt Ltd. 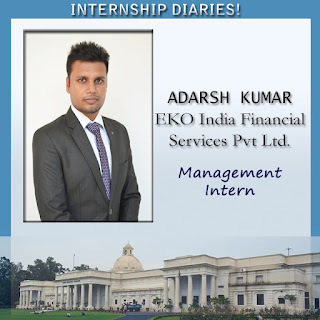 I did my internship with EKO India Financial Services Pvt. Ltd., which is an Indian financial service company, and India’s first Business Correspondent (BC) service company. It provides no-frills bank accounts and deposit, withdrawal and remittance services to customers (nearly 80% of whom are migrants or the unbanked section of the population) through mobile banking. With Bharti AXA Life Insurance Company, it provides Bharti AXA Life - Bachat Bima, micro-insurance policies. After acing the money remittance sector through business correspondent model EKO got the licence for PPI from RBI. Prepaid payment instruments are those which facilitate purchase of goods and services against the value stored on such instruments. The value stored on such instruments represents the value paid for by the holder, by cash, by debit to a bank account, or by credit card. As an intern at EKO, I was involved in doing market research and operations for my project which was defining new age customer experience. I had to make the process smooth for transactions resolve complaints registered from CSP(customer service point) of EKO. During this project I on-boarded help desk for EKO. During internship I analysed about E-value pattern of the csp and which gave me an idea how to increase transaction amount for each csp. I introduced target based e-value concept. As market research work I found that our csps were facing a lot of problem like status of transaction, customer care problem and e-value, for which I gave a solution that to include a status based tracking GUI in our portal.